I am not a big fan of the Pumpkin Spice Latte but I do love pumpkin spiced things. Especially rusty orange colored clothes like this dress. Blake and I have yet to hit the pumpkin patch so this is my way of channeling those pumpkin vibes. (Don’t worry! We are headed to the pumpkin patch with Lola next week!!) With everything that has been changing with my body, fitting into pants has been challenging. All my IVF girls know that all those needles in the belly end up in weight gain, you guessed it, right in the belly. So while pants are not my best friend these days, flowy swing dresses are just the thing to keep me feeling my best. It was also an excuse to pull out one of my favorite over the knee boots to dress things up. The pair I am wearing is from last season but I love this updated skinny heel version. So good. I am excited for tomorrow because IT’S MY BIRTHDAY!! I am so sad because Blake is traveling for work but lucky to have my girlfriends who will go out to celebrate with me. We did have an AMAZING dinner at Nobu last night so I am lucky we got to celebrate together before he left. So looks like I might take myself for a little pre-birthday shopping today. A little self love is all anyone ever really needs for their birthday. Remember to treat yourself every once in a while. Because you know what, you deserve it!! Charmaine Ng | Architecture & Lifestyle Blog - I love, love, love the shade of the dress! I recently bought so many pieces in the same shade. It’s truly the perfect colour for fall. 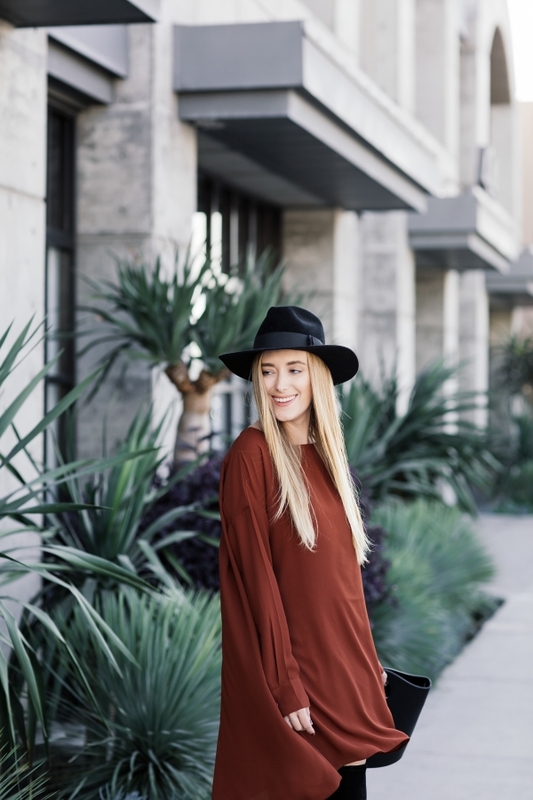 Natali - You’re looking wonderful in this Fall perfect and boho styled outfit! I love your dress! Sharon - You nailed it with this look! I’ve been looking for a sweater or dress in this color for a couple weeks, I think it’s perfect for Thanksgiving. I think there is something romantic and edgy about the color, kinda burnt orangish red. I hope you’re having a great Monday… I saw that you were out with Mara, I love and read her blog too! Go Eagles! Jaime - Such a perfect look for fall! LOVE your bag and the color of the dress! Kristie - Fall approved, for sure!